The wild progenitor of barley, Hordeum spontaneum, is typically a winter-germinating species, responsive to day length (Turner et al. 2005), but recent work (H. Jones et al. 2008) has demonstrated that the non-responsive allele also occurs in wild barley in Israel, Jordan and Iran, in regions where this allele is favoured by the climatic conditions. There is strong evidence to suggest that the non-responsive allele in European cultivars (Group A) is genetically more similar to the allele in Iranian wild barleys than to the allele in wild barleys from Israel and Jordan. Detailed genetic comparisons between groups A, B and C (H. Jones 2008; H. Jones et al. 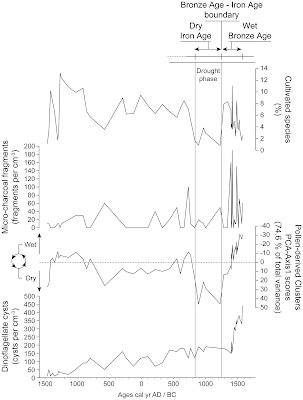 2008) suggest that Group A represents a more recent introduction of day-length non-responsive barley into Europe, rather than the selection of non-responsiveness from within populations that diffused into Europe in the Early Neolithic. In addition, three of the nine principal groups identified on the basis of the neutral SSR markers (groups 1–3) are genetically closely related and very similar in their phenotypic characteristics. They are located in north-west and Central Europe (Figure 3b), and are made up almost entirely of day-length non-responsive barleys (98 per cent) with a spring growth habit (98 per cent) (H. Jones et al. 2011). 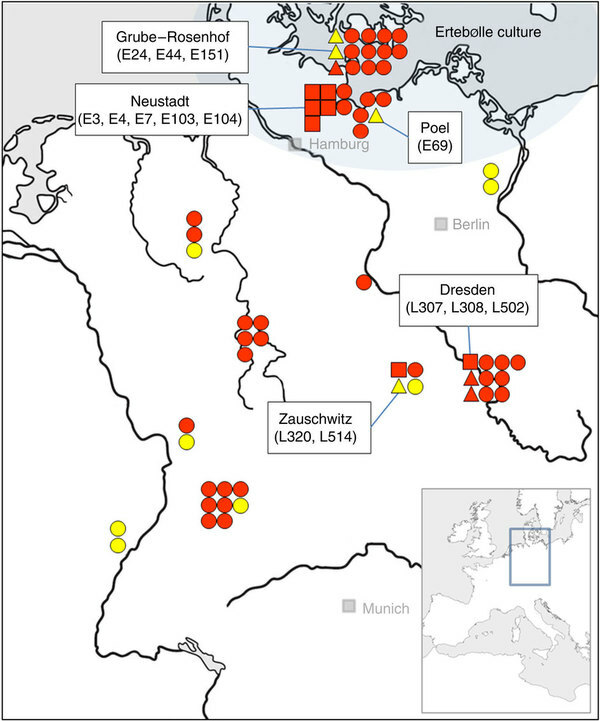 The distinctiveness of the landraces making up groups 1–3 suggests that the responsive/non-responsive difference between Southern and Northern Europe is not simply a reflection of current selective pressure but rather is one aspect of a more fundamental genetic difference between barley populations. These day-length non-responsive cultivars have therefore been interpreted as representing a later spread of barley into Northern Europe from the eastern part of the Fertile Crescent or beyond. 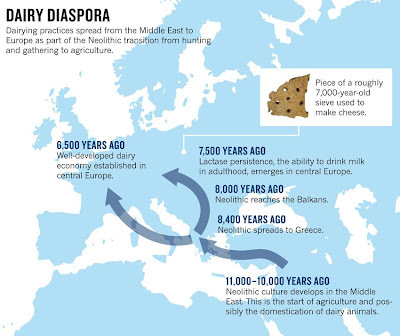 This raises the issue of when they spread into Europe and whether or not they were introduced via the same route as the initial spread of agriculture. A possible channel for the introduction of day-length non-responsive barley into Northern Europe from the east at this time could have been through early exchange networks with metal-working communities of south-eastern Europe (Sherratt 1976; Bogucki 1999: 220–21). The Chalcolithic societies of the Balkans also maintained connections further east with the west Eurasian Steppes, Anatolia, and the Caucasus in the fifth and early fourth millennia, and copper was exchanged from west to east across the steppes north of the Black Sea (Kohl 2007: 31–39). Day-length non-responsive barley could, therefore, have travelled from east to west along the same route, north of the Black Sea via the Caucasus or, perhaps more likely given its agricultural nature, south of the Black Sea through Anatolia, possibly via a coastal route around the Black Sea, and then from the Carpatho-Balkan metallurgical region into Northern Europe (Figure 3b). A similar suggestion has been made for the later appearance of the oil plant Lallemantia, which was apparently introduced into Europe in the third millennium BC, possibly along the same trade routes as tin-bronzes (Valamoti & Jones 2010). It has long been recognised that the Neolithic spread across Europe via two separate routes, one along the Mediterranean coasts, the other following the axis of the major rivers. But did these two streams have a common point of origin in south-west Asia, at least with regard to the principal plant and animals species that were involved? This study of barley DNA shows that the domesticated barley grown in Neolithic Europe falls into three separate types (groups A, B and C), each of which may have had a separate centre of origin in south-west Asia. Barley was relatively rarely cultivated by the early Linearbandkeramik farmers of Central and Northern Europe, but became more common during the fifth and fourth millennia BC. The analysis reported here indicates that a genetic variety of barley more suitable for northern growing conditions was introduced from south-west Asia at this period. It also suggests that the barley grown in south-eastern Europe at the very beginning of the Neolithic may have arrived there by different routes from two separate centres of domestication in south-west Asia. The multiple domestications that this pattern reveals imply that domestication may have been more a co-evolutionary process between plants and people than an intentional human action. 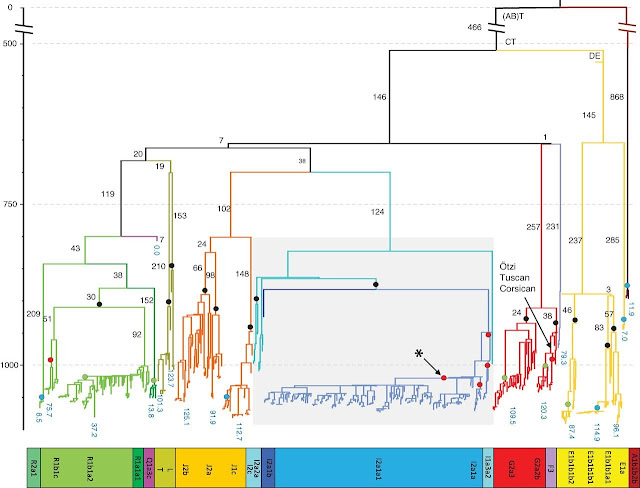 I haven't read this, but the idea of looking at looking at nuclear sequences of mitochondrial origin (numt) as a way of testing for archaic admixture seems interesting to me. Human mtDNA has a relatively shallow coalescence (less than 200 thousand years), with Neandertal mtDNA being a clear outgroup, and Denisovan mtDNA being an even more remote outgroup. If modern humans admixed with archaic ones (having mtDNA lineages much more remote than "Eve"), then the evidence may have been lost (due to drift) in mtDNA, but may have been preserved in the autosomes. Africa demonstrates a complex process of the hominin evolution with a series of adaptive radiations during several millions of years that led to diverse morphological forms. Recently, Hammer et al. (2011) and Harvati et al. (2011) provided integrated morphological and genetic evidence of interbreeding between modern humans and unknown archaic hominins in Africa as recently as 35,000 years ago. However, a genetic evidence of hybridization between hominin lineages during the Lower and Middle Pleistocene epochs is unknown and the direct retrieval of DNA from extinct lineages of African hominins remains elusive. The availability of both nuclear and mitochondrial genome sequences from modern humans, Neanderthals, and Denisovans allows collecting nuclear DNA sequences of mitochondrial origin (numts) inserted into the nuclear genome of the ancestral hominin lineages and drawing conclusions about the hominin evolution in the remote past. 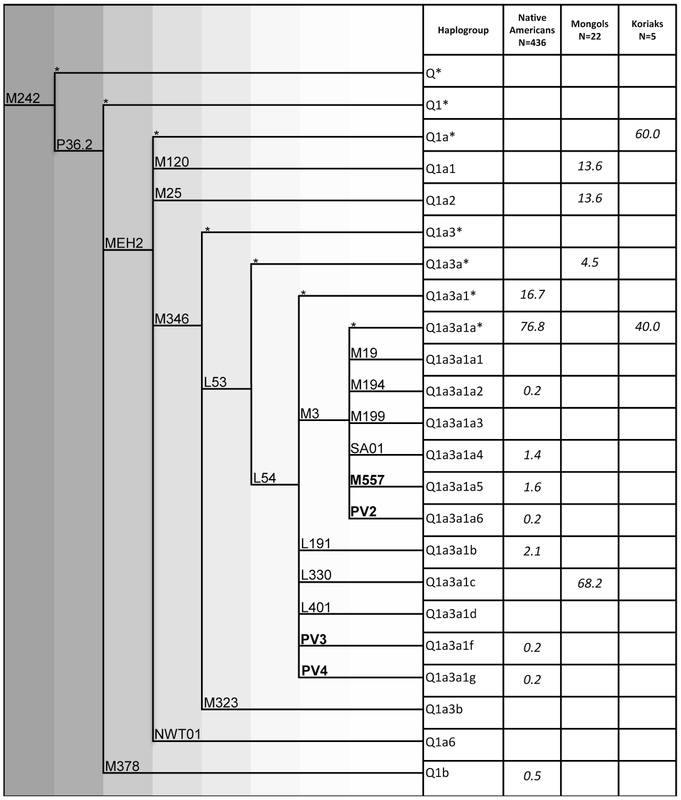 The mtDNA and numt analysis uncovered a deep division of mtDNA lineages that existed in African hominins in the Middle Pleistocene. The first cluster included the human and Neanderthal-like mtDNA sequences while the second consisted of DNA sequences that are known today as mtAncestor-1, a nuclear fossil of the mtDNA, and the Denisova mtDNA isolated from a bone and a tooth found in southern Siberia. The two groups initially diverged 610,000-1,110,000 years ago. Approximately 220,000 years after the primary split, the Denisova - mtAncestor-1 mtDNA lineages mixed with the mtDNA pool of an ancestral population of Neanderthals and modern humans. This admixture after the profound division is demonstrated by the transposition of the Denisova-like mtDNA sequence into the nuclear genome of an ancestor of Neanderthals and modern humans. This finding suggests the matrilineal genetic structure among the Middle Pleistocene hominins as well as the existence of gene flow between African hominin lineages. Through paleogenomic analyses, it is impossible to exclude the theory that population structure and gene flow in African hominins influenced the admixture pattern observed in the nuclear genomes of non-Africans. This is a nice demonstration of transfer of domesticated animals from Neolithic farmers to European hunter-gatherers. (Red=European, Yellow=Near Eastern). Related: Ottoni et al. (2012). This study addresses the question of how purifying selection operates during recent rapid population growth such as has been experienced by human populations. This is not a straightforward problem because the human population is not at equilibrium: population genetics predicts that, on the one hand, the efficacy of natural selection increases as population size increases, eliminating ever more weakly deleterious variants; on the other hand, a larger number of deleterious mutations will be introduced into the population and will be more likely to increase in their number of copies as the population grows. 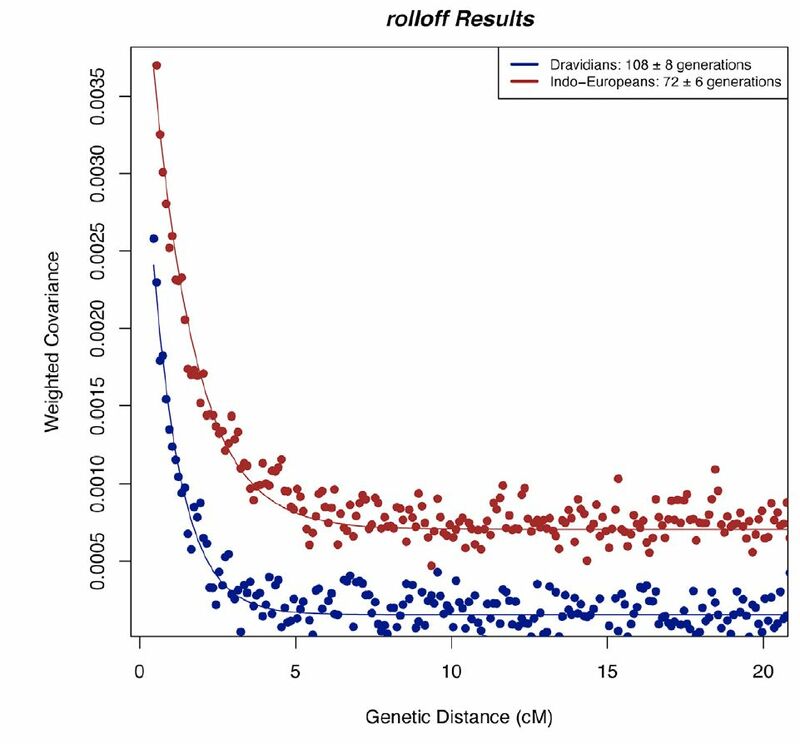 To understand how patterns of human genetic variation have been shaped by the interaction of natural selection and population growth, we examined the trajectories of mutations with varying selection coefficients using computer simulations. We observed that while population growth dramatically increases the number of deleterious segregating sites in the population, it only mildly increases the number carried by each individual. Our simulations also show an increased efficacy of natural selection, reflected in a higher fraction of deleterious mutations eliminated at each generation, and a more efficient elimination of the most deleterious ones. As a consequence, while each individual carries a larger number of deleterious alleles than expected in the absence of growth, the average selection coefficient of each segregating allele is less deleterious. Combined, our results suggest that the genetic risk of complex diseases might be distributed across a larger number of more weakly deleterious rare variants. The main purpose of this paper is to present lexical correspondences that unite Armenian with Greek and/or Indo-Iranian. They include shared innovations on the one hand, and isolated lexemes on the other. These two lexical corpora — lexical innovations on an inherited basis and isolated words — can be placed within the same temporal and spatial framework. After the Indo-European dispersal Proto-Armenian would have continued to come into contact with genetically related Indo-European dialects. Simultaneously, it would certainly also have been in contact with neighbouring non-Indo-European languages. A word can be of a substrate origin if it is characterized by: (1) limited geographical distribution; (2) unusual phonology and word formation; (3) characteristic semantics. The material presented here, albeit not exhaustive, allows to preliminarily conclude that Armenian, Greek, (Phrygian) and Indo-Iranian were dialectally close to each other. Within this hypothetical dialect group, Proto-Armenian was situated between Proto-Greek (to the west) and Proto-Indo-Iranian (to the east). The Indo-Iranians then moved eastwards, while the Proto-Armenians and Proto-Greeks remained in a common geographical region for a long period and developed numerous shared innovations. At a later stage, together or independently, they borrowed a large number of words from the Mediterranean / Pontic substrate language(s), mostly cultural and agricultural words, as well as animal and plant designations. On the other hand, Armenian shows a considerable number of lexical correspondences with European branches of the Indo-European language family, a large portion of which too should be explained in terms of substrate rather than Indo-European heritage. Recent progress in the phylogenetic resolution of the Y-chromosome phylogeny permits the male demographic dynamics and migratory events that occurred in Central and Southern America after the initial human spread into the Americas to be investigated at the regional level. 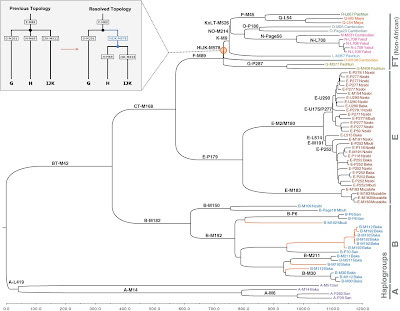 To delve further into this issue, we examined more than 400 Native American Y chromosomes (collected in the region ranging from Mexico to South America) belonging to haplogroup Q – virtually the only branch of the Y phylogeny observed in modern-day Amerindians of Central and South America – together with 27 from Mongolia and Kamchatka. 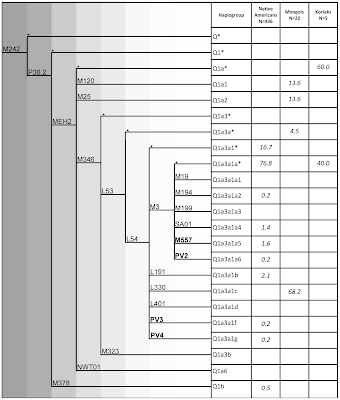 Two main founding lineages, Q1a3a1a-M3 and Q1a3a1-L54(xM3), were detected along with novel sub-clades of younger age and more restricted geographic distributions. The first was also observed in Far East Asia while no Q1a3a1-L54(xM3) Y chromosome was found in Asia except the southern Siberian-specific sub-clade Q1a3a1c-L330. Our data not only confirm a southern Siberian origin of ancestral populations that gave rise to Paleo-Indians and the differentiation of both Native American Q founding lineages in Beringia, but support their concomitant arrival in Mesoamerica, where Mexico acted as recipient for the first wave of migration, followed by a rapid southward migration, along the Pacific coast, into the Andean region. Although Q1a3a1a-M3 and Q1a3a1-L54(xM3) display overlapping general distributions, they show different patterns of evolution in the Mexican plateau and the Andean area, which can be explained by local differentiations due to demographic events triggered by the introduction of agriculture and associated with the flourishing of the Great Empires. Mike J. Church et al. We report on the earliest archaeological evidence from the Faroe Islands, placing human colonization in the 4th–6th centuries AD, at least 300–500 years earlier than previously demonstrated archaeologically. The evidence consists of an extensive wind-blown sand deposit containing patches of burnt peat ash of anthropogenic origin. Samples of carbonised barley grains from two of these ash patches produced 14C dates of two pre-Viking phases within the 4th–6th and late 6th–8th centuries AD. A re-evaluation is required of the nature, scale and timing of the human colonization of the Faroes and the wider North Atlantic region. Found in a burial at Basur Höyük, a 820- by 492-foot mound near Siirt in southeast Turkey, the elaborate pieces consist of 49 small stones sculpted in different shapes and painted in green, red, blue, black and white. "Some depict pigs, dogs and pyramids, others feature round and bullet shapes. 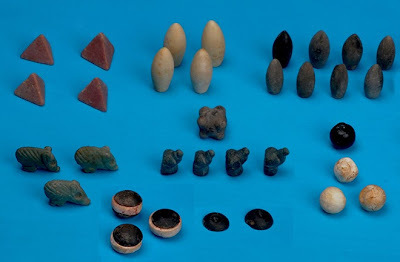 We also found dice as well as three circular tokens made of white shell and topped with a black round stone," Haluk Saglamtimur of Ege University in Izmir, Turkey, told Discovery News. This is a nice illustration of people's familiarity with several abstract geometrical shapes for the purposes of gaming. I had referred to this collection of papers before, and now all the PDFs appear to be available free of charge. Language and archeology: some methodological problems. Central Asia up to the early Middle Ages. Tarim Basin and the steppelands. It seems that the PIE urheimat debate is alive and well. Linkage disequilibrium (LD) is often summarized using the "LD curve," which relates the LD between pairs of sites to the distance that separates them along the chromosome. This paper shows how the LD curve responds to changes in population size. An expansion of population size generates an LD curve that declines steeply, especially if that expansion has followed a bottleneck. A reduction in size generates an LD curve that is high but relatively flat. In European data, the curve is steep, suggesting a history of population expansion. These conclusions emerge from the study of $\sigma_d^2$, a measure of LD that has never played a central role. It has been seen merely as an approximation to another measure, $r^2$. Yet $\sigma_d^2$ has different dynamical behavior and provides deeper time depth. Furthermore, it is easily estimated from data and can be predicted from population history using a fast, deterministic algorithm. The first part of this research published previously proved without doubt that the metals dated to the Nordic Bronze Age found in Sweden were not smelted from the local copper ores. In this second part we present a detailed interpretation of these analytical data with the aim to identify the ore sources from which these metals originated. The interpretation of lead isotope and chemical data of 71 Swedish Bronze Age metals is based on the direct comparisons between the lead isotope data and geochemistry of ore deposits that are known to have produced copper in the Bronze Age. The presented interpretations of chemical and lead isotope analyses of Swedish metals dated to the Nordic Bronze Age are surprising and bring some information not known from previous work. Apart from a steady supply of copper from the Alpine ores in the North Tyrol, the main sources of copper seem to be ores from the Iberian Peninsula and Sardinia. Thus from the results presented here a new complex picture emerges of possible connectivities and flows in the Bronze Age between Scandinavia and Europe . A new paper on the topic of Indian population history has just appeared in the American Journal of Human Genetics. 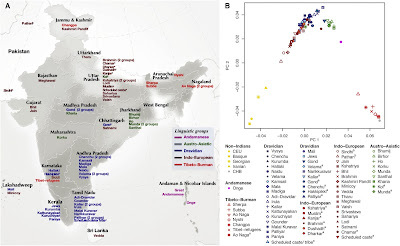 In previous work it was determined that Indians trace their ancestry to two major groups, Ancestral North Indians (ANI) (= West Eurasians of some kind), and Ancestral South Indians (ASI) (= distant relatives of Andaman Islanders, existing today only in admixed form). The new paper demonstrates that admixture between these two groups took place ~4.2-1.9 thousand years ago. This is of course true, because admixture postdates migration and it is conceivable that the West Eurasian groups might not have admixed with ASI populations immediately after their arrival into South Asia. On the other hand, a long period of co-existence without admixture would be against much of human history (e.g., the reverse movement of the Roma into Europe, who picked up European admixture despite strong social pressure against it by both European and Roma communities, or the absorption of most Native Americans by incoming European, and later African, populations in post-Columbian times). It is difficult to imagine really long reproductive isolation between neighboring peoples. 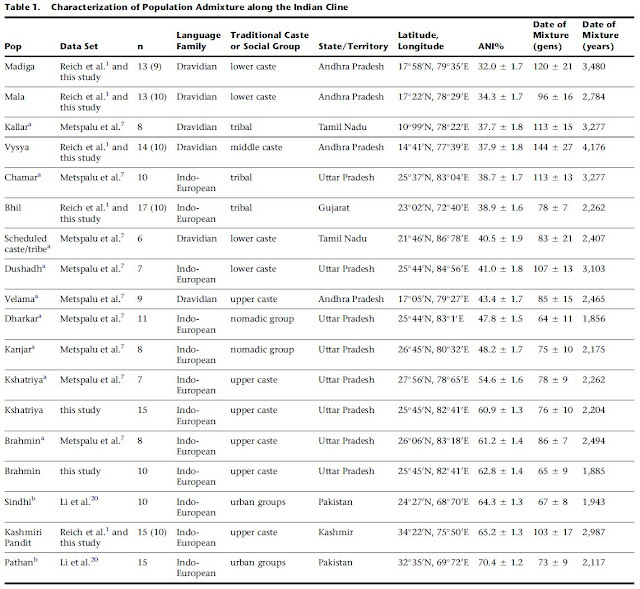 Such reproductive isolation would require a cultural shift from a long period of endogamy (ANI migration, followed by ANI/ASI co-existence without admixture) to exogamy ~4.2-1.9kya (to explain the thoroughness of blending that left no group untouched), and then back to fairly strict exogamy (within the modern caste system). It might be simpler to postulate only one cultural shift (migration with admixture soon thereafter, with later introduction of endogamy which greatly diminished the admixture. The authors cite the evidence from neolithic Sweden which does, indeed, suggest that the neolithic farmers this far north were "southern European" genetically and had not (yet) mixed with contemporary hunter-gatherers, as they must have done eventually. But, perhaps farmers and hunters could avoid each other during first contact, when Europe was sparsely populated. It is not clear whether the same could be said for India ~4 thousand years ago with the Indus Valley Civilization providing evidence for a large indigenous population that any intrusive group would have encountered. In any case, the problem of when the West Eurasian element arrived in India will probably be solved by relating it to events elsewhere in Eurasia, and, in particular, to the ultimate source of the "Ancestral North Indians". It is also possible that some of the ANI-ASI admixture might actually pre-date migration. At present it's anyone's guess where the original limes between the west Eurasian and ASI worlds were. There is some mtDNA haplogroup M in Iran and Central Asia, which is otherwise rare in west Eurasia, so it is not inconceivable that ASI may have once extended outside the Indian subcontinent: the fact that it is concentrated today in southern India (hence its name) may indicate only the area of this element's maximum survival, rather than the extent of its original distribution. In any case, all mixture must have taken place somewhere in the vicinity of India. A second interesting finding of the paper is that admixture dates in Indo-European groups are later than in Dravidian groups. This is demonstrated quite clearly in the rolloff figure on the left. Moreover, it does not seem that the admixture times for Indo-Europeans coincide with the appearance of the Indo-Aryans, presumably during the 2nd millennium BC: they are much later. I believe that this is fairly convincing evidence that north India has been affected by subsequent population movements from central Asia of "Indo-Scythian"-related populations, for which there is ample historical evidence. So, the difference in dates might be explained by secondary (later) admixture with other West Eurasians after the arrival of Indo-Aryans. 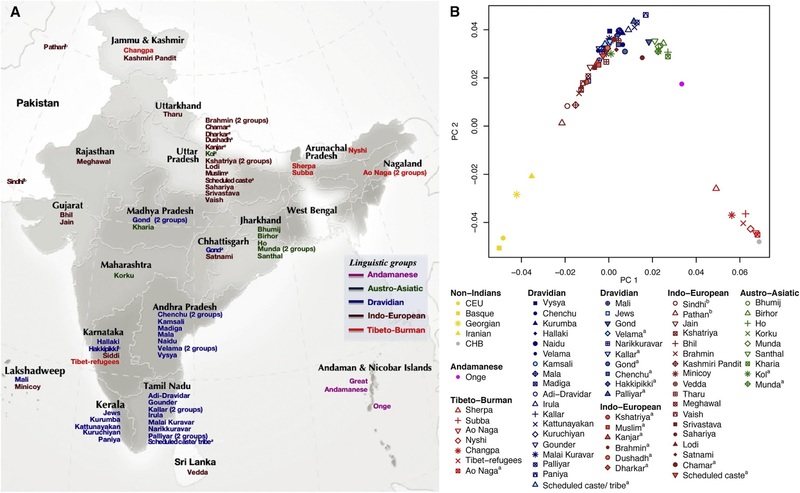 Interestingly, the paper does not reject simple ANI-ASI admixture "often from tribal and traditionally lower-caste groups," while finding evidence for multiple layers of ANI ancestry in several other populations. My own analysis of Dodecad Project South Indian Brahmins arrived at a date of 4.1ky, and of North Indian Brahmins, a date of 2.3ky, which seems to be in good agreement with these results. The authors also report that "we find that Georgians along with other Caucasus groups are consistent with sharing the most genetic drift with ANI". I had made a post on the differential relationship of ANI to Caucasus populations which seems to agree with this, and, of course, in various ADMIXTURE analyses, the component which I've labeled "West Asian" tends to be the major west Eurasian element in south Asia. Sadly, the warm and moist climate of India, and the adoption of cremation have probably destroyed any hope of studying much of its recent history with ancient DNA. On the other hand, the caste system has probably "fossilized" old socio-linguistic groups, allowing us to tell much by studying their differences and correlating them with groups outside India. This should be very interesting watching. Feel free to leave a comment if you notice anything new or interesting in any of the videos. That next step happened slowly, and it seems to have required the spread of lactase persistence. 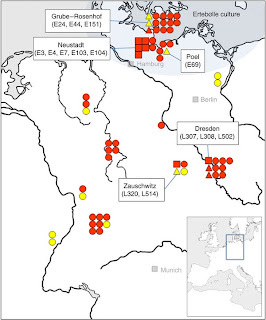 The LP allele did not become common in the population until some time after it first emerged: Burger has looked for the mutation in samples of ancient human DNA and has found it only as far back as 6,500 years ago in northern Germany. 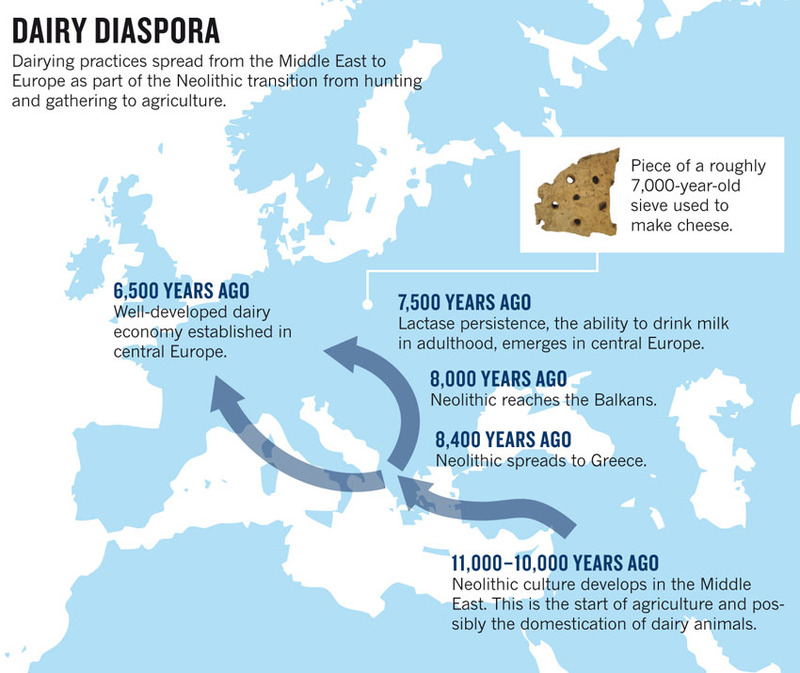 Some of the LeCHE participants are now probing further back in time, as part of a project named BEAN (Bridging the European and Anatolian Neolithic), which is looking at how the first farmers and herders made their way into Europe. Burger, Thomas and their BEAN collaborators will be in Turkey this summer, tracing the origins of the Neolithic using computer models and ancient-DNA analysis in the hope of better understanding who the early farmers were, and when they arrived in Europe. A couple of important new papers on human Y-chromosome phylogeny appeared in Science today. Francalacci et al. 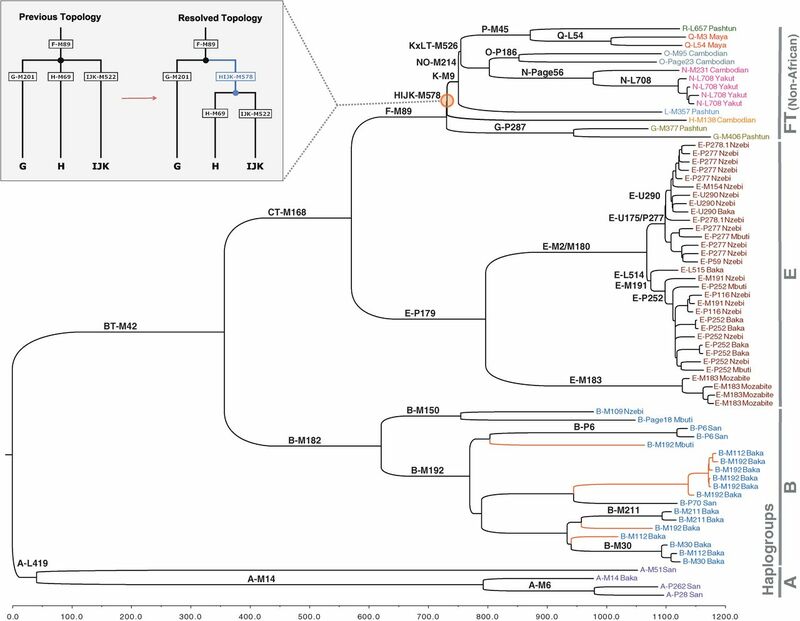 reconstructs the phylogeny of European Y-chromosomes based on a huge sample of 1,200 Sardinians. Naturally, Sardinians don't have every haplogroup in Europe or the planet, but with such a huge sample it was possible to find almost everything, minus obvious newcomers such as Uralic haplogroup N.
Poznik et al. build a human Y-chromosome phylogeny from 69 male genomes. The main thrust of their paper is to reconcile the "younger" Y-chromosome vs. "older" mtDNA in humans. In my opinion, that ship has sailed with the discovery of Y-haplogroup A00 which now makes the Y-chromosome MRCA of humans ("Adam") much older than the mtDNA one ("Eve"). And, indeed, the fact that the two are of different ages is not particularly troubling or in need of remedy, since for most reasonable models of human origins we do not expect them to be of the same age. Well, unless you believe the latest archaeological models that have early proto-sapiens perfecting their craft by scratching lines and perforating beads in some south African cave before spreading out to colonize the planet in one swift swoop. The issue of the "discrepancy" aside, Poznik et al. resolve the issue of the binary structure of Y-haplogroup F, by showing that Y-haplogroup G (which is the Iceman's haplogroup, and the lineage most strongly associated with easly European farmers) branches off first from the tree. Haplogroup G is an unambiguously west Eurasian lineage, so the fact that it is basal within F surely has implications about the origins of this most successful Eurasian group. The pattern is not quite clear, however, because the next most basal branch is H, which is unambiguously South Asian, and the next one after that is IJ vs. K, with IJ again being west Eurasian, with most east Eurasians nested within K. But, if we go up the tree, we see the split of C (Asian) vs. F (Eurasian), and further up DE (African+Eurasian) vs. CF (Eurasian). It seems to me that apart from the unambiguous African rooting of the entire tree, the rest of the topology paints a picture of a complex peopling of Eurasia, rather than a simple model of successive founder effects. 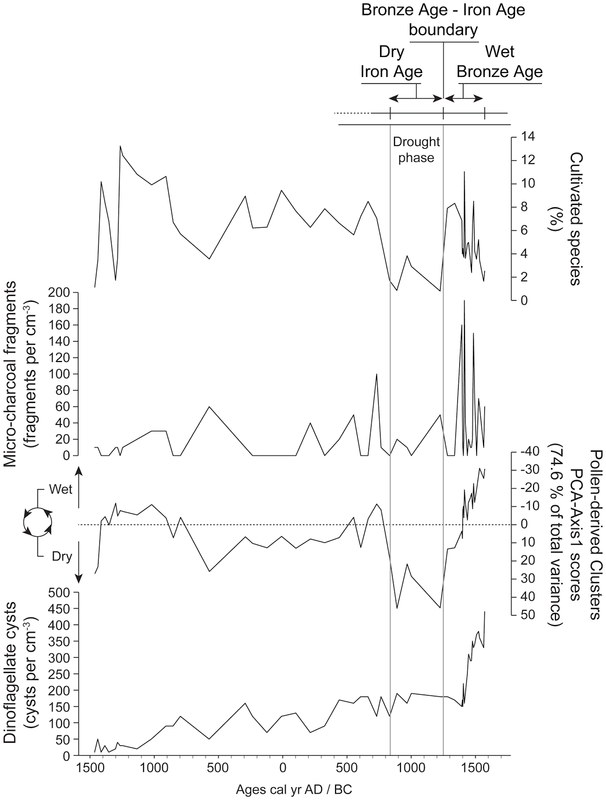 Another interesting finding of Poznik et al. is the discover of deep substructure within Y-haplogroup A-L419 (bottom of the picture). Using entry to the Americas as a calibration point, we estimate a mutation rate of 0.82 × 10−9 per base pair (bp) per year [95% confidence interval (CI): 0.72 × 10−9 to 0.92 × 10−9/bp/year] (table S3). This is notable for being lower than the directly estimated mutation rate of 1x10-9 of Xue et al. (2009). Considering that our analysis focused on approximately 8.97 Mbp of sequence from the Y chromosome X-degenerated region, this rate is equivalent to 0.53 × 10−9 bp−1 year−1. The main non-African super-haplogroup F-R shows an average variation of 534.8 (±28.7) SNPs, corresponding to a MRCA of ~110,000 years ago, in agreement with fossil remains of archaic Homo sapiens out of Africa (7, 18) though not with mtDNA, whose M and N super-haplogroups coalesce at a younger age (13). The main European subclades show a differentiation predating the peopling of Sardinia, with an average variation ranging from 70 to 120 SNPs (Table 1), corresponding to a coalescent age between 14,000 and 24,000 years ago, which is compatible with the postglacial peopling of Europe. I am personally skeptical of all such archaeological calibrations and I'd like to see the mutation rate directly estimated using a well-behaved process (say, a 1,000-year old deep pedigree between two modern males separated by 60 meioses). It seems that there is no escape from mutation rate controversies in human genetics. R2 in Sardinia! This is extremely rare in Europe and underscores the importance of large sample sizes. It'd be wonderful to study it in the future in the context of, say, South Asian R2 which is much more numerous. A very deep common ancestry of haplogroups L and T.
"Explosive" growth of I2a1a1; this "southwest European" lineage attains its maximum in Sardinia and looks like a clear founder effect. It should definitely be visible in the ancient DNA record of the island. Fairly deep splits within G2a. It would be interesting to see how G2 compares with Caucasian G1. We now know that G is very old lineage in West Eurasia (being the first split in haplogroup F), but how much of its present-diversity dates back to splits shortly after the haplogroup's appearance? There's probably much more of interest in these twin papers, so if you notice anything in the supplementary materials, feel free to leave a comment. G. David Poznik et al. A new paper was posted on the arXiv. 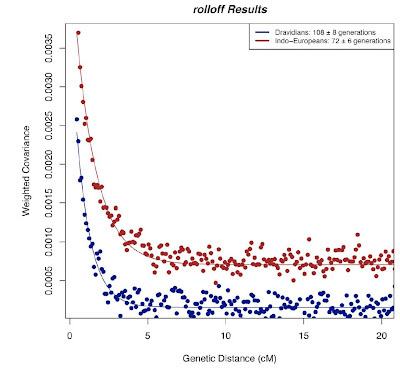 UPDATE (Feb 18, 2014): This has now been published in Genetics. Although there has been much interest in estimating divergence and admixture from genomic data, it has proven difficult to distinguish gene flow after divergence from alternative histories involving structure in the ancestral population. The lack of a formal test to distinguish these scenarios has sparked recent controversy about the possibility of interbreeding between Neandertals and modern humans in Eurasia. We derive the probability of mutational configurations in non-recombining sequence blocks under alternative histories of divergence with admixture and ancestral structure. Dividing the genome into short blocks makes it possible to compute maximum likelihood estimates of parameters under both models. We apply this method to triplets of human Neandertal genomes and quantify the relative support for models of long-term population structure in the ancestral African popuation and admixture from Neandertals into Eurasian populations after their expansion out of Africa. Our analysis allows us -- for the first time -- to formally reject a history of ancestral population structure and instead reveals strong support for admixture from Neandertals into Eurasian populations at a higher rate (3.4%-7.9%) than suggested previously.